Business travel costs made transparent. Maximum returns on every Rupee/Dollar spent annually. Identifying travel patterns to save on hidden business travel costs. Tracking rise and drop in prices as they occur to improve travel budgets. Claim residual value for your cancelled transaction and reconcile. Travelling is a behaviour and travelling patterns in an enterprise can be analysed to optimise costs with assured, verified and economical cost plans. Tripnomics, powered by TravelSpends uncovers hidden insights from business-travel data. TravelSpends Analytics combines the best processes and expertise to keep business travel costs under control and provides your organisation with a competitive edge in the market. A huge part of an organisation’s expenditure is dictated by travel costs. It is a challenge to come to grips with travel data and analytics. 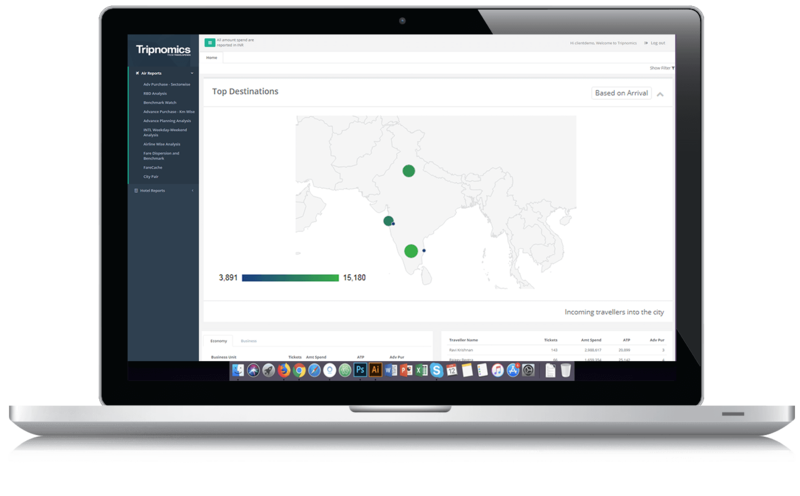 Through insights and analysis, TravelSpends helps capture the behavioural pattern of your corporate travel in the form of custom-made dashboards. "The first rule of any technology used in a business is that automation applied to an efficient operation will magnify the efficiency. The second is that automation applied to an inefficient operation will magnify the inefficiency." When technology is at our disposal, we should utilize it for the best interest of an organization. Our technology tools include solutions for automation of Trip Approval Management, SLA Tracking & TAT audits. Your organization can benefit from our expertise in the travel domain for designing specialised analytical tools for audit, travel technology apps & social media integration for better customer experience. Helping airlines and airports get one step closer to their customers using social media. Supporting travel trade to digitize visa-processing function and real-time status updates for customers. Automating pre-business trip approval for seamless experience and efficiency. At TravelSpends, we understand the travel and aviation industry, and we understand it very well. As domain experts, we are backed by professionals who come with decades of experience and understanding of the aviation and travel business. We uncover hidden insights in business travel data for the optimum cost per trip index for an enterprise.